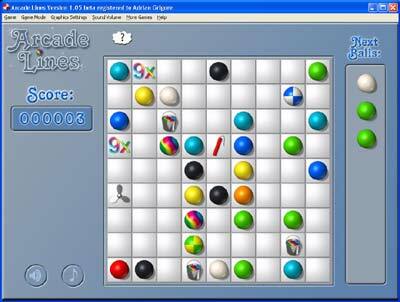 Arcade Lines is an extremely addictive puzzle game using brilliant graphics, pulsating music and a great variety of different game modes. It is very easy to learn, but not so easy to master! You'll be hooked for hours. Try to prevent the board from filling by forming rows of 5 or more pieces of the same color. Also great for the kids, keeping them amused while developing strategic thinking. This is a must-have download for every puzzle game fan! ...... The rows will disappear, leaving more space for new pieces. Watch out! The fan will blow your game pieces away . Dissolve the multiplier and get 3, 6, or even 9 times higher scores . Repaint surrounding pieces the same color using the Paint Bucket . Qweas is providing links to Arcade Lines 1.80 as a courtesy, and makes no representations regarding Arcade Lines or any other applications or any information related thereto. Any questions, complaints or claims regarding this application Arcade Lines 1.80 must be directed to the appropriate software vendor. You may click the publisher link of Arcade Lines on the top of this page to get more details about the vendor.